So, was Cincinnati Bengals owner/president/GM/waterboy Mike Brown really bluffing when he said that Carson Palmer was retired and he had no intentions of trading him? Maybe. But when someone desperate, like the Oakland Raiders, calls and offers you a first-round pick and possibly another one…I guess your ears perk up. The Bengals shipped Palmer to the Raiders in exchange for a 2012 first-round pick and a 2013 second-round pick, that can become a first rounder. That’s quite a haul for a guy who hasn’t practiced in a long time. Also, he’s been kind of crappy now for a few years. That shouldn’t be forgotten either. The Raiders are 4-2, exactly one half game behind the San Diego Chargers, who have not looked like world beaters so far this season (although it should be noted that they usually stink up the joint and finish strongly, so that could be bad news for the rest of the division). So, they obviously feel like they have a chance to be something this season and the “being something” plans don’t include Kyle Boller as their starting QB. Probably a good idea. But, boy…if this doesn’t work out. If Carson takes too long to get acclimated or never gets acclimated, they just gave up a haul. To be without a first-round pick next year and then to potentially be without one the following year? Let’s not forget they used their third-round pick in the supplemental draft on Terrelle Pryor and gave up their second rounder in a draft-day trade in 2011. Yikes. That can set a franchise back a bit if things don’t work out. The Bengals, however, could be sitting pretty. It looks like they’ve replaced Palmer well with Andy Dalton and A.J. Green could end up being better than Chad Johnson ever was (that remains to be seen obviously). Now they are adding more draft picks to a team that is already winning with young heads? Don’t screw this up, Mike Brown. Looks like he was the smart one all along. 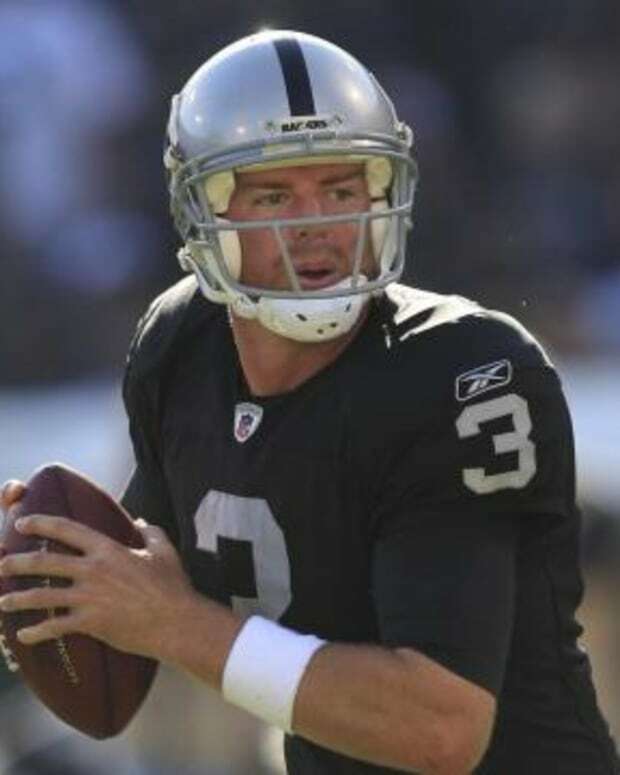 NFL Analysis: Dolphins Interested in Carson Palmer? Oakland Raiders Talking to Steelers about Ben Roethlisberger? Oakland Raiders News: Darren McFadden is Making "Huge Progress"